For a long time I had been puzzled by this photograph of my aunt wearing what seemed to be a military outfit. 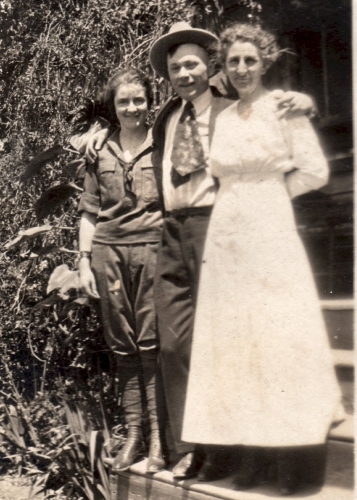 The photo is dated 1919; the man next to her eventually became her husband, and her mother is wearing a dress that was already old-fashioned. I knew that English women had entered previously male occupations during World War I (1914-1918); England’s heavy mobilization and casualties meant that women were needed as factory workers, farmers, drivers of trucks and buses, etc. 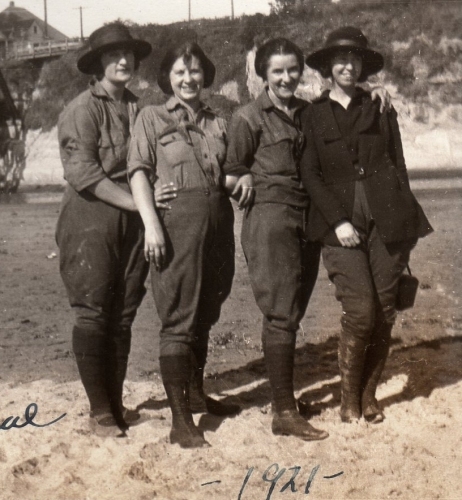 But the United States did not enter the war until April of 1917, so, although American women were ready to volunteer for previously male occupations, and fashion was heavily influenced by military styles, American women were never called upon to fill traditionally male roles in the same numbers as their British sisters. 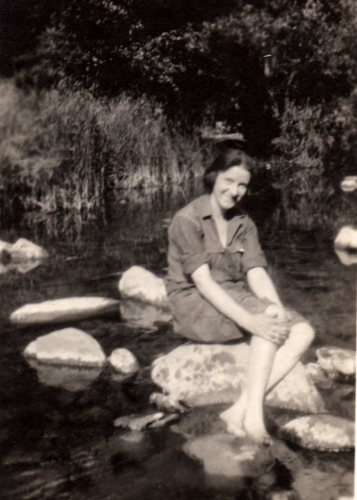 So why was my teen-aged aunt dressed in what seems to be an olive drab wool uniform? A favorite part of any hike is cooling your feet in a stream. 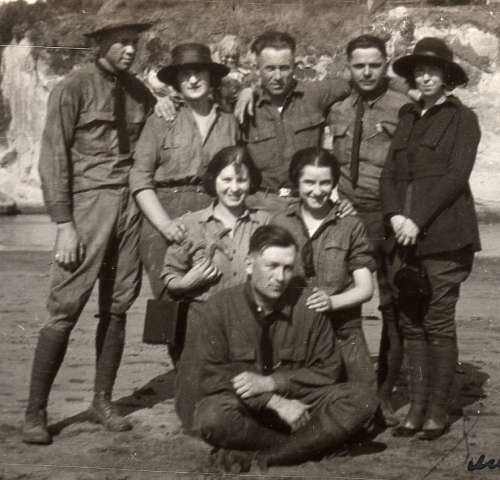 This set of photos were taken on a group trip to Santa Cruz, a beach resort in northern California; they are dated 1921. 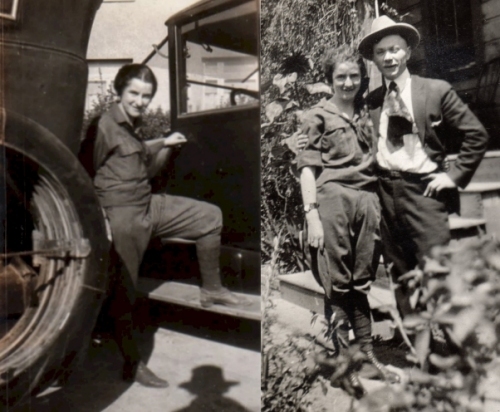 What is remarkable about these photos that the men and the women are dressed so much alike. Such clothing, defying traditional gender roles – in public! – would have been unthinkable just a few years before. Amazing photos! I know that American women were mobilized, voluntarily, during World War I as “farmerettes,” etc. Those jobs had uniforms. 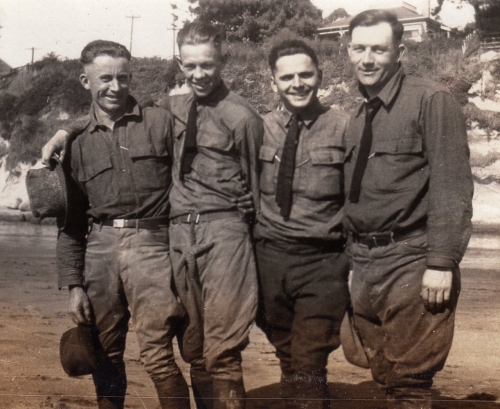 Perhaps the thrill of easy, uniform-like dressing lasted past the war. 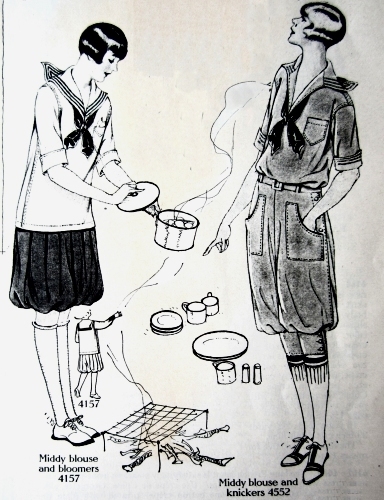 It is interesting that young women in the 1920s picked this particular “uniform” to be the acceptable outdoors attire. I think part of it must be that this generation grew up wearing bloomered gym attire, and so it was not that big of a leap to knickers and breeches. And there was that whole “garcon” trend, and in a way they are mimicking the dress of young boys. Another factor might be the rise of summer camps, where knickers were the mode. A fascinating subject! Good point about the “garcon” look — these outfits certainly don’t look slimming, so it never occurred to me that this was part of the same 1920s mind-set that Chanel took advantage of when she wore borrowed menswear for sports in England. I LOVE the camping clothing here! The pants almost look as thought they are jodhpurs!! What fun!!!! What a fantastic piece of history to have of your family and to be able to see change happening with gender roles thru fashion is even cooler. Great blog post! Thanks! I’m trying to emphasize “everyday fashion” worn by working class people. As far as I know, my aunt and most of her friends were office workers.